Interested in becoming a cna? When and where are classes taught? 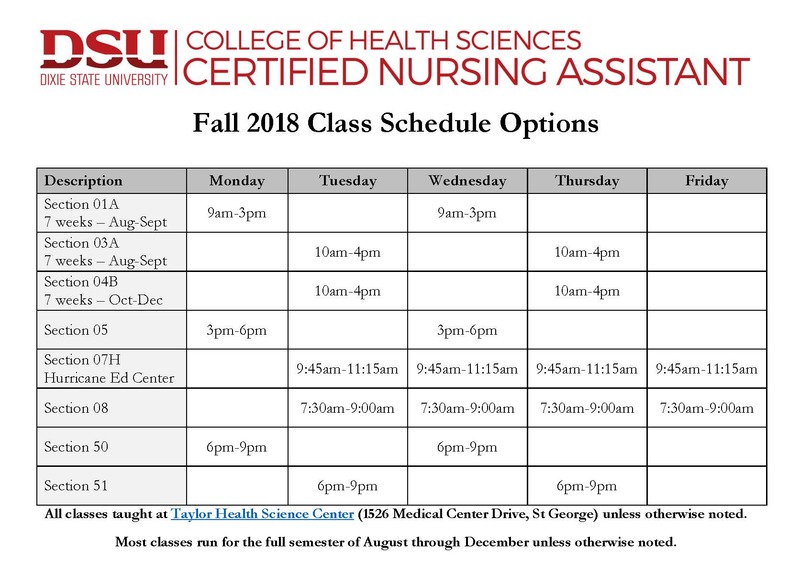 Certified Nurse Assistant classes are taught each semester with a variety of days and hours to fit most everyone's schedule. Many classes run the full semester, but some classes are on a 7-week block schedule. Check the current class schedule for information on upcoming classes. Classes are taught off-campus at the Taylor Health Science Center or the Hurricane Education Center. Other classes may be available at different locations depending on the specific semester. Class times listed here as an example. Days/times are subject to change. How many credits is the course? The CNA Course is 4.0 credits. To successfully complete the course, each student must complete at least 76 hours of classroom and 24 hours of clinical experience. Once students successfully complete the 4.0 credit course, they are eligible to take the state exam for certification. The course fee is $30 (laboratory). There is a $50 fee for immunization and paperwork tracking (not covered by tuition). Other costs not covered by tuition vary and include background check ($59), drug screen ($30), vaccinations and/or blood work proving immunity ($100-300). approach to caregiving (4th ed.). Philadelphia: Wolters Kluwer. Scrubs. One set of scrubs is required to be worn during labs and clinical. Shoes. Medical, professional, or athletic footwear required. Must be clean, closed toe. No bright colors. Photo Name Badge. Provided by DSU. $10 replacement fee. Stethoscope & Blood Pressure Cuff required. Cost is approximately $40 at DSU Campus Store. How Do I Register for the CNA Class? What do I need before I start the course? You are NOT required to complete any steps prior to starting the course beyound registration and tuition payment. However, if you'd like to get ahead and reduce your out-of-pocket costs, follow the Pre-Admission Checklist. All other items must be completed after coursework begins.